Jeff Greenwald's classic travelogue follows his quest for the "perfect" Buddha statue. At turns hilarious and moving, his quest features a cast of amazing characters  from a passionate palmist to a flying lama  who provide unforgettable glimpses into the daily life and culture of the former kingdom (including a wild ride on Kathmandu’s very first escalator). Greenwald doesn't shy away from Shangri-la’s darker side. Along with colorful descriptions of Hindu and Buddhist mythology, the book tells of the rampant corruption, art smuggling, assassination attempts and human right abuses that would ignite Nepal’s violent "People Power" Revolution in April 1990. A new afterword by the author recounts Nepal's tumultuous recent history  including the massacre of the royal family  in vivid detail. And a new preface introduces this 25th anniversary edition with some thoughts about how Nepal, and travel writing, have evolved since the book’s first publication. 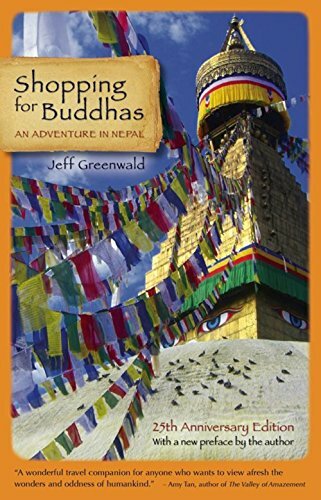 Shopping for Buddhas remains a must-read for anyone who has visited, or plans to visit, Nepal.